With this kit, you will make the Scrappy Patchwork Pillow that is featured in Stitch Spring 2015! With this kit, you will make the Scrappy Patchwork Pillow that is featured in Stitch Spring 2015! Quick and colorful, this happy pillow cover uses buttons to secure the patchwork instead of quilting. Easy piecing, no quilting, and lots of print and color—it doesn’t get much better than that. 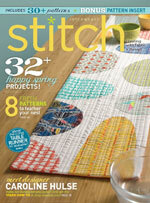 You will receive the Stitch Spring 2015 issue which has the pattern for the Scrappy Patchwork Pillow. You'll also get a charm pack of FreeSpirit "True Colors" fabric by Anne Marie Horner. 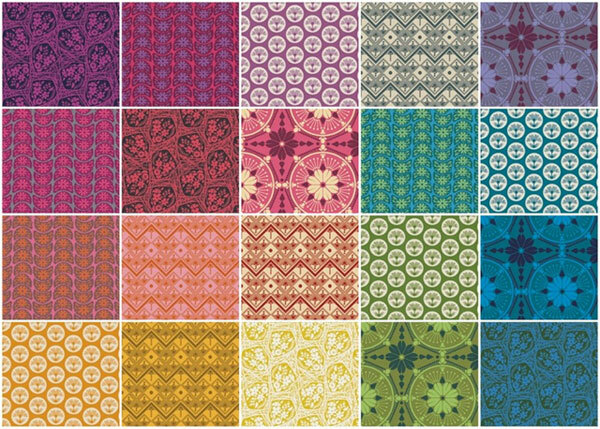 These bright printed fabrics are perfect to make your Scrappy Patchwork Pillow with. This issue has plenty of projects to get you inspired to rev up your own machine. With sections like Return to Retro, Wardrobe Warmup, Feathering Our Nests, and Daily Rituals, there's no shortage of modern sewing patterns with springtime flair. Plus, you'll find a helpful technique spotlight on pattern markings and a fun feature on rising star designer Caroline Hulse. With this charm pack, you will get 42 5" squares of fabric, 2-3 pieces of each print. Use these bright and fun fabrics to create your Scrappy Patchwork Pillow.